Joab seeks an object lesson for King David to encourage him to reconcile with his estranged son, Absalom. 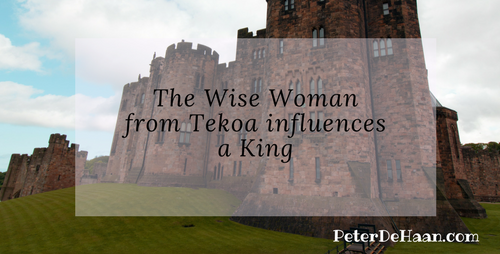 Joab sends for a wise woman from Tekoa and coaches her what to say to the king. The story she skillfully shares with the king—of how one son killed the other and is now on the run—is a ruse. With her surviving son being sought for murder, she seeks the king’s protection. Her pretend story parallels David’s real story, of Absalom killing Amon and then fleeing to another country. With increasing urgency, she three times asks for David’s support. Three times he promises his protection, each time with increased fervency. Then, with boldness, she connects her story to King David’s, asking him to follow his own advice and apply it to his son Absalom. David suspects Joab’s hand in this and then tells Joab to arrange for Absalom’s return. Playing her part brilliantly, the wise woman from Tekoa, sets in motion the homecoming of Absalom. Thanks to her, Joab’s plan worked.